Winter scenes. Hooking a sunset or sunrise sky. Hooking snow. I have begun hooking my Snow Angel piece for the Magdalena Rug Hookers group project. I might not be the only one doing a snow angel design and, if so, it will be fun to see how we each interpret it. I think the best pieces of wool in my stash are the spot-dyed ones that I have dyed or bought. The random splashes of color make any hooked rug interesting to look at. I’ve used many spot-dyed noodles in this sky. As we all know, it doesn’t matter how many noodles/worms we use, it doesn’t make a dent in the supply on hand. It’s one of the great mysteries of rug hooking. This Snow Angel piece isn’t very big, just 16” x 22”, so I should be finished in a week or so. 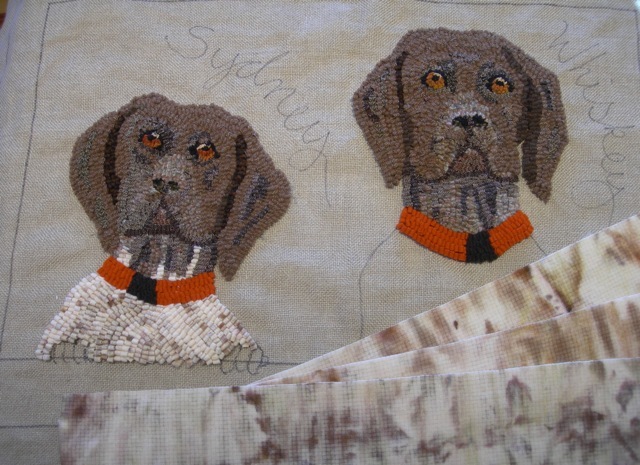 At that point I will explain how I block and finish my rugs and what a big difference a good blocking can make. This was a suggested topic by Lucy Richard of Wooly Mason Jar fame and I’m happy to do it. I’ve written about how I bind the edges of most of my rugs. If you’re interested, you can read that blog here. I’ll be starting on my next super secret rug any day now. I feel the deadline looming. There’s a lot of beauty out there and in hooking a few of my favorite things. 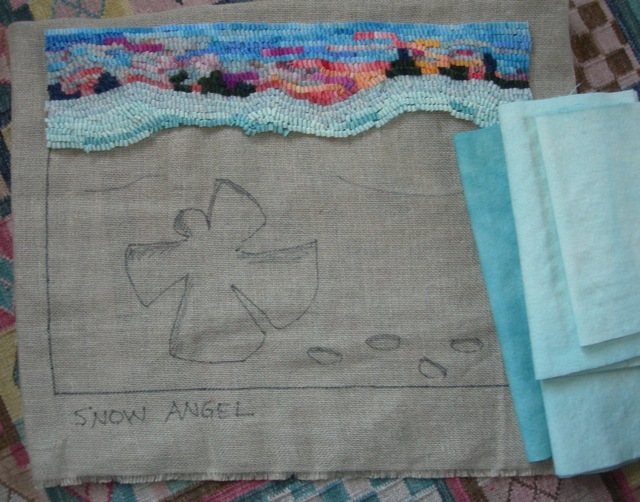 A sunset sky and snow wool for the Snow Angel mat.